If you’re a reader, a fan of Mean Girls, Saturday Night Live and/or 30 Rock, a parent, love a good laugh, or all of the above, then you’re going to love our big news. Tina Fey, an incredible: 9x Primetime Emmy Award winner 2x Golden Globe winner 5x Screen Actors Guild Award winner 4x Writers Guild of America Award winner AP Entertainer of the Year Mark Twain Prize-winner for American Humor …will be in Cleveland on September 6, 2018 to close out an incredible week at Content Marketing World 2018. Far beyond her gif-worthy character Liz Lemon, or her award-winning depiction of Sarah Palin, the slapstick and physical comedy, or the multitude of other characters she has played in TV shows and film, Tina Fey is much more than the laugh-producing actor you see on the screen and love and relate to so much. Prior to 30 Rock, she was the first female head writer of Saturday Night Live, before she made the transition to the front of the camera. That’s where she became famous for her role as co-anchor on SNL’s Weekend Update – both award-winning and groundbreaking – and who could forget her parody of Former Governor Sarah Palin during the 2008 presidential election? You can’t be that kid standing at the top of the waterslide, overthinking it…You have to let people see what you wrote.” ~ Tina Fey CMI and many content marketing industry leaders, many of which will be at Content Marketing World, have expressed time after time that if you wait until your content, your website, your targeting, your strategies are perfect, you’ll never actually do anything. Do your thing and don’t care if they like it. ~ Tina Fey Content marketing and storytelling is about sharing YOUR story. You can’t be everything to everyone, so by finding your niche and your tilt, you can do your thing and appeal to the right audience. 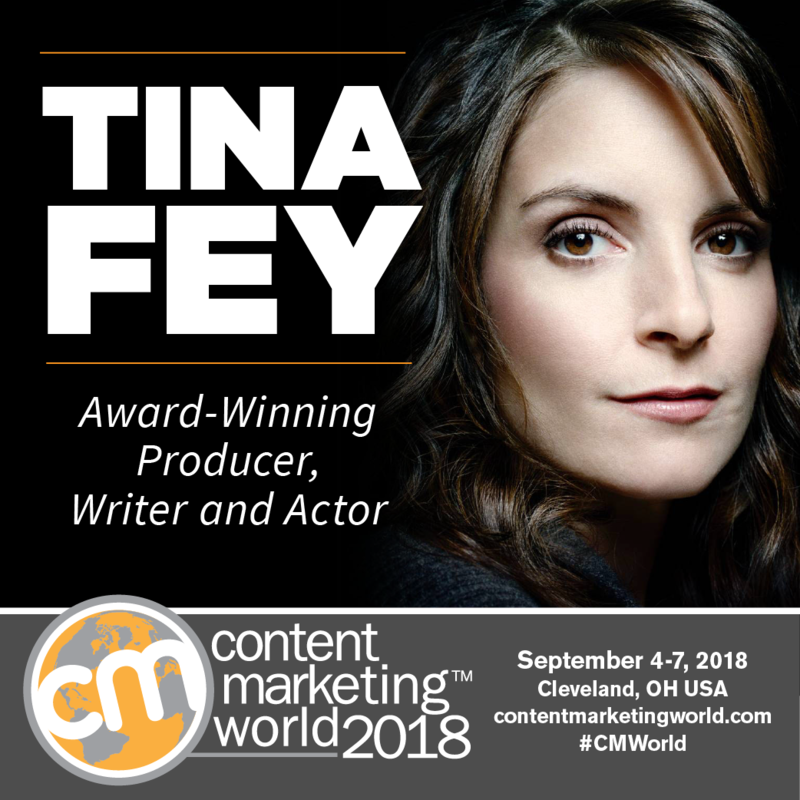 We hope you can join us in September at Content Marketing World as 250 marketing practitioners and industry speakers from all over the world help us fine-tune our own disciplines of content marketing, and the brilliant Tina Fey inspires us by telling us stories about her own storytelling. If you’re a reader, a fan of Mean Girls, Saturday Night Live and/or 30 Rock, a parent, love a good laugh, or all of the above, then you’re going to love our big news. YES…Tina Fey will be headlining Content Marketing World 2018! …will be in Cleveland on September 6, 2018 to close out an incredible week at Content Marketing World 2018. 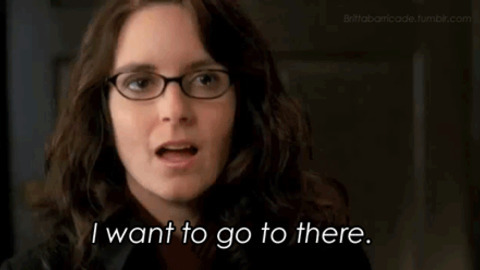 Before you say “I want to go there” and jump over to the Content Marketing World registration page, let’s chat a little bit about the genius that is Tina Fey. Far beyond her gif-worthy character Liz Lemon, or her award-winning depiction of Sarah Palin, the slapstick and physical comedy, or the multitude of other characters she has played in TV shows and film, Tina Fey is much more than the laugh-producing actor you see on the screen and love and relate to so much. We already know this about Fey: She’s earned an Emmy, two Golden Globes, four SAG Awards, and a People’s Choice Awards for her role as Liz Lemon on 30 Rock, the critically acclaimed NBC series, that she created. Prior to 30 Rock, she was the first female head writer of Saturday Night Live, before she made the transition to the front of the camera. That’s where she became famous for her role as co-anchor on SNL’s Weekend Update – both award-winning and groundbreaking – and who could forget her parody of Former Governor Sarah Palin during the 2008 presidential election? Fey also wrote and starred in the hit cult film, Mean Girls, which made its debut as a Broadway musical this year….